Clifford P. Keen came to Ann Arbor, Michigan in 1925 to attend Law School and lead the upstart University of Michigan Wolverines Wrestling Program into Big Ten Conference prominence. Dave Taylor, former NCAA referee has beautifully captured the story of a true University of Michigan and Wrestling legend, Cliff Keen. Coach Keen holds the longest tenure of any Head Coach in Wolverine athletics history, which includes both wrestling and football. Included in this intriguing book are eloquent stories, summaries, features, and countless interviews of former wrestlers and football players who competed for Coach Keen. 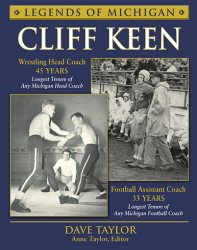 Read about interesting recruiting pipelines and learn about the “coaching tree” of legends with Cliff Keen being one of the true pioneers in American collegiate wrestling. There are over 40 features within the book, including the Rise and Fall of Small College Wrestling, the History of Olympic Wrestling, the History of the Michigan High School Wrestling Tournaments and much more. Whether you’re a coach, a wrestler, an athlete, or simply a fan, you will thoroughly enjoy this book.